Blackjack is a game that has been around for years. Because of that, there have been countless people who have tried to find the perfect strategy to the game. In essence, it comes down to reducing the house advantage over the player. The lower this advantage is, the higher probability of success for the player. 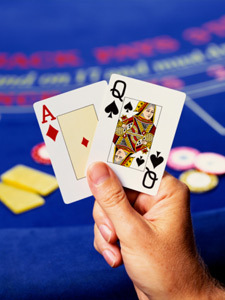 Since the introduction of computers, Blackjack players have used this to their advantage to input data that will benefit them. This created the Blackjack calculator, a simple machine that processes the outcomes with the given cards to tell the player what to do. This calculator was also used to determine what the best method is for Blackjack. In essence, Blackjack comes down to statistics. By looking at what is available and what the odds look like, a player may even be able to earn extra money while they play. This is the benefit that is given to the player since the dealer must stick to a strict set of rules, limiting the number of things that they are allowed to do. For example, the dealer has a rule that tells them when to hold and when to take another card. A smart player can look at the data and know when to take a hit and when to hold. For example, the dealer has a chance of busting that is over thirty five percent if they have a card face up that is between a three and six. This means that the player should just hold and see if the dealer busts, keeping them from busting themselves. On the other hand, if the dealer has a face up card that is an Ace or anything from a seven to ten, it is recommended that you take another card. This is because the dealer can very easily have a ten point card that can defeat you if you don't take a hit. Here are some other tips to consider when you are playing. Always stand if you have anything higher than a seventeen, but hit on anything less than eight. If you have anything between a twelve and sixteen, look at the dealer's card and take a hit if it is a seven or higher. Double down on eleven, unless the dealer has revealed an Ace. If the dealer has a nine or lower, double down on ten. If you have a six, double down only if the dealer has a six or lower. Always stand on a soft nineteen or twenty. Double down on a soft thirteen through eighteen if the dealer has anything from a four to a six. Always split Aces and eights, while never splitting tens or fives.